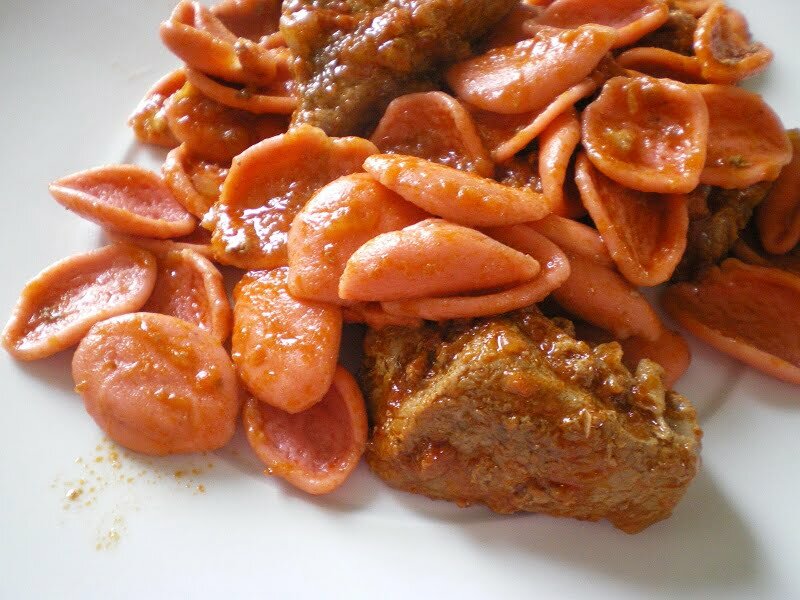 Moschari Kokkinisto is a Greek stewed recipe with veal. We don’t prefer beef in Greece so most of the Greek dishes are made with veal. Kokkinisto in Greek means “reddened” which is the final outcome of a veal dished cooked in red wine and tomato. This traditional Greek dish is perfect for a family Sunday dinner. It can also be made with lamb, chicken, pork, rooster, rabbit or game. When making it with chicken I prefer to add white wine as the sauce becomes much lighter. Spices vary depending on what you prefer but mostly cinnamon, cloves, bay leaf and pepper are used. Pork is also made kokkinisto with the addition of vegetables, such as celery root, with cauliflower or pork with taro. Vegetables which are cooked in tomato sauce such as cauliflower, potatoes, beans etc. are called giahni or ladera, instead of being called kokkinista. Kokkinista are usually served with pasta, mashed potatoes, fried potatoes or rice. I found the perfect homemade Cretan pasta for this dish which is a tomato based rose petal shaped pasta. The recipe “Kotopoulo Kokkinisto” which is a chicken stew, is included in my cookbook Mint, Cinnamon & Blossom Water, Flavours of Cyprus, Kopiaste! This lovely dish goes to Presto Pasta Nights, which I am hosting this week. Presto Pasta Nights is the brainchild of Ruth and is one of my favourite events and I have been submitting pasta dishes every since I started blogging. Pasta is so versatile that you can combine it with all your favourite ingredients and make a lovely dish without having to spend hours in the kitchen (well sometimes you do!!) but search your closets and find what kind of pasta you have there and in half an hour you can feed your family. So what are you waiting for, get creative and send me your pasta dish. Wash meat and cut it into 1 1/2 cm thick slices and pat dry. Heat the olive oil in a sauteing pan and saute the meat on both sides. Add the onions and garlic and saute them until translucent. Add the wine and cook for a few minutes for the alcohol to evaporate and then add all the spices, salt, bay leaves and tomato, as well as 1 cup of water and bring to a boil. Reduce heat and simmer until the meat is tender and soft and the sauce is reduced and thickened. Serve with pasta, rice, mashed potatoes or fried potatoes. Moschari Kokkinisto is a Greek stewed recipe with veal. We don't prefer beef in Greece so most of the Greek dishes are made with veal. Kokkinisto in Greek means "reddened" which is the final outcome of a veal dished cooked in red wine and tomato. Finally, I am also sending this recipe to a new friend of mine, Debbie of Kahakai Kitchen, for her Event Souper Sundays, so if you have made soups, stews, chilis etc. send them to Deb as well. I love that pasta shape and design Ivy! Beautiful with the kokkinisto. This looks so delicious I may have to make it today! Also thinking some variation of it would make a pretty Christmas dish with basil on top! This looks really yummy and comforting, yum yum. The pasta is so gorgeous! How delicious and flavorful! This pasta dish sounds so delicious. The addition of cinnamon and berries to the sauce sounds quite interesting – a change from the red sauce I am accustomed to making. Definitely I will have to try this recipe. I hope I can find the rose petal pasta. You know Sis I beleive we have Cretan pasta here in K-town. I was at our local Mediterranean market and they offered exactly what you have in your photo (also in green). This sounds like such a tasty side dish to go with everything!!! What a gorgeous dish and so interesting to read about. That pasta on its own is incredible. Thanks for participating in Souper Sundays. The post is up and featuring the new logo–which I can’t thank you enough for! Very neat. I don’t think I’ve ever seen pasta like that. I’m also curious what it would taste like with cinnamon and cloves. Happy (belated) New Year, Ivy! Your pictures are beautiful Ivy!! I like this method of cooking. The pasta is so cute that just putting it with any protein would be gorgeous. Kokkinisto always makes me feels warm & cozy…a fine Greek comfort dish. I really like that pasta you used here too! Bravo Ivy! We love kokkinisto around here. 🙂 Looks wonderful and that pasta is simply gorgeous. I have never tried anything Greek before. But this dish sounds and looks delicious to me! This is my husband’s favorite meal (and one of mine, too!). I love the tomato rose-petal pasta! I’ve never seen anything like that. Your kokkinista is beautiful and looks delicious! That pasta looks so cool! Haven’t seen this shape before. Everything looks yummy! Beautiful dish Ivy! The colors are amazing. I’ve tried the regular (non tomato) version of this pasta and I think it is great. Very hearty pasta that I made once with our usual cinnamon scented kima to change things up a bit from the usual spaghetti. I will definitely be sending over a pasta dish this week. It has been a while since I’ve done so but will see to it that I get one in. I’ve never seen rose petal pasta before – how lovely. what an idea to make rose ptel shaped pasta. the very thought of it makes you feel good. :)looks really delicious! Thats a gorgeous pasta. Im a fan of anaythin cooked in tomato. I was just thinking about Click, and then I saw your badge. Good luck. I’m drooling. The photo and the recipe….awesome and perfect for the bone-chilling weather we’re having. It’s -12C and the wind chill makes it feel like -27C.